As many of you know, I’m a big fan of simple cooking. Indeed, Calabrian cuisine is noted for its simplicity, using few ingredients but making sure they’re the best you can possibly find. As winter approaches, there’s nothing more simple and delicious than what I’m offering you for this week’s What’s Cooking Wednesday. Before P came along, I always roasted chestnuts in the oven, slitting the tops with Xs and then roasting them on a cookie sheet drizzled with a little olive oil. With this method, set the oven to 425°F (218°C) and let the chestnuts roast until the outside shell separates from the slits on top (about 15-20 minutes). The inside will be soft. You can also do this without the oil, of course, but I like the extra kick of flavor. Now, though, especially since we’ve been using the fireplace more, P just slices off the top and a bit off of each side, and puts them right in the smoldering ashes. Some minutes later and they’re done, if a bit dirty. Wipe them off, and look! I like to think of them as wearing little vests. Of course you can also do this with a roasting pan over the fire, and you’ll get the kind that Nat King Cole used to sing about. Just always be sure to expose the nut in some way before you roast to avoid explosions. I hear that gets messy. Whether the roasted chestnuts are from the oven or the fire, be extra careful removing them as they’re hot. You can either let them cool first and then squeeze them to get the nuts out of the shells or simply wrap them all in a hand towel while they’re still hot and press them till you hear lots of cracking sounds. Why chestnuts of course! We didn’t have them very often when I was growing up, but they’ve definitely become a winter favorite of mine since I’ve been here. I haven’t tried any recipes using them, mostly because I never seem to have any chestnuts around as we eat them too fast. I welcome any of your favorite chestnut recipes, though! We roasted some chestnuts just last night. N roasts them in the oven, and just cuts a slit on one side. They’re much cuter the way P does them, though! I’m thankful for chestnuts too. I wouldn’t be very happy without chestnut gelato, my favorite flavor! *KC, I have to admit I’m partial to the vest-looking cuts, so I think I’ll be doing them that way from now on too. Also, I’ve never had chestnut gelato…mmmmm…. Well…not a recipe, but in France my friend once brought me Marron Glace, which is a chestnut spread. You can spread it on crepes..mmmmm…or she used to eat it straight from the tube! It is quite yummy. You can also smell the chestnuts roasting on the streets at the vendors in NYC!!! It means the Holidays are here….. I went out and bought a pan with holes on the bottom. Hopefully, next batch will come out better! For some reason, chestnuts escaped my childhood. Not sure why, really. But that just means that they were there to be discovered when I was grown, which is what I did. Funny how that works. Your recipes are wonderful and yet again, the photography splendid. Thank you Sognatrice. Okay, I may have to give roasted chestnuts another try one of these days. The only time I’ve had them was on a winter day in downtown Seattle many years ago, and I swear they tasted like feet. Granted, I must preface this by saying I’m not known to be a foot licker, but that was about as close as I could assume feet taste like. 😉 Perhaps my palate is more refined now and I’d like them better…um, I mean roasted chestnuts…not feet. Oh, yum. Our parents taught us to do this, and they are such a treat. I will say, though, that for the purposes of chestnut stuffing created at 5:00 a.m. on Thanksgiving day, it is far, far more fabulous to buy organically grown ones pre-cooked and pre-peeled in nice, recyclable glass bottles at Trader Joe’s, Whole Foods, or whatever is your Italian equivalent, than it is to boil or roast them and then peel them with raw fingers and not enough sleep. My mother’s chestnut stuffing — which of course I have not written down but used to make every year — had cooked chestnuts very roughly crumbled, chopped celery, celery seed, stale or toasted bread (she used -gak- white bread like Webber or Wonder; I prefer rosemary garlic sourdough) torn into little bits, finely chopped onions, chicken stock, sage (and I use lots and lots of fresh chopped sage, whereas she used the dried stuff out of the bottle), salt and pepper to the cook’s taste, and rosemary. I stick a few sprigs of rosemary into the bird whole and around the bottom of the roasting pan to flavor the basting jus, though again, she just used it ground from the bottle. I have added from time to time chopped carrots, sautéed and drained mushroom slices, and/or garlic, used shallots or leeks instead of yellow onion, pre-sautéed the onions with the mushrooms and maybe a splash of wine, etc., and if you don’t have chestnuts, you can use pecans, walnuts, or pine nuts, pine nuts being especially good in roast chicken. But on Thanksgiving you’d better have chestnuts and not overdo the fancy stuff like wine or you’ll kill their delicate flavor. HMMMM….chestnuts. I love chestnuts…must have chestnuts…well, I guess I’m stopping at the grocery store on the way home tonight. Does anyone have a trick for making them easier to separate from that weird inner furry skin when you’re trying to eat them? When we make them in a pan “alla brace,” that part always sticks to it and I don’t like eating it… then we went to a restaurant a few weeks ago and they made some for us after dessert and they separated away so easily and perfectly I was amazed. Duh, I should have asked them at the restaurant… but there must be a secret trick? What do they taste like? Texture? Ooooh, I love chestnuts!!! 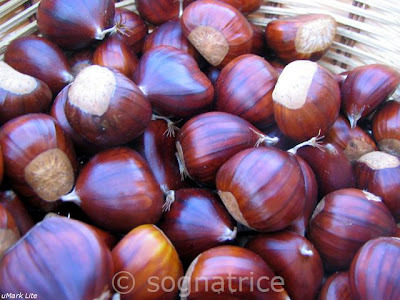 Even the kind you can’t eat, horse chestnuts, were fun to play with as a child, and so pretty! Roasted chestnuts were very common in Japan, too. *Giulia, aw, come on–get your mind out of the gutter 😉 I have seen people do them here with holey pans and non-holey pans. I think perhaps you just left them in too long? *Qualcosa, very true. I hope you can enjoy them soon! *David, another late comer to the chestnut table; we’re so lucky to have found them at all! *Sara, excellent advice on the stuffing; I can’t imagine I’d enjoy playing around with chestnuts pre-dawn for any reason. I’ve never had chestnut stuffing…yet…. *Karina, I think that’s a splendid idea! *Shelley, I don’t really know, but I can tell you that I’ve had various experiences with the fur. I think it might actually have something to do with the chestnuts themselves (maybe how long since they’ve been off the tree or something?). I’ve had batches that some were furry and some weren’t, so it didn’t seem like it was cooking time or anything else special with preparation. *Geggie, oh this is a tough one. They’re, um, nutty, kind of sweet, and basically the texture you might think a softened nut would be–no longer crunchy, but not mushy either. Kind of al dente, if you want to use an Italian phrase 😉 Sorry that’s not much help…can someone else describe? *Janet, I had no idea they’re popular in Japan too; thanks for sharing some info and good memories! Grandma used to roast chestnuts in the winter. chestnuts are one of the best reasons to love this part of the year. I never thought or rasting them in the oven. Usually I roast them in the fireplace, but it take some care to get the right amount of flame and you have to keep an eye on them . I’ll have to try that. You made me wonder if I could possibly even microwave them. I’ll try that too. With a *very* limited amount of chestnuts. As a recipe, you may consider monte bianco. That’s a dessert my mother usually makes at xmas (along with 1-3 other desserts : xmas family lunches are serious business) and sometimes in other circumstances. It’s basically mashed chestnuts with some liquor and covered with cream. I won’t enter in the details of the recipe since the preparing is not the part of the process I’m usually involved with. Of course I then feel guilty about not helping my poor mother and I try to compensate by adding extra effort in devouring it. Luigi, I’m almost sorry to say that I know microwaving works–my mom does this! Be careful, though, on figuring out how long to put them in for…she recently had an ugly explosion (only one chestnut, thank goodness, and the microwave still works too!). I don’t have any chestnut recipes and I don’t have a fireplace, as I would love to roast some. How fun would that be. The only time I’ve ever eaten them is from a street vendors in London. mmmhhh yummy! That’s right, it’s castagne time! It’s always a chore here in the Toronto area to find good ones, but thankfully my new job is in one of the Italian areas of the city, so I’m sure I’ll be able to find some. Just picked some castagne up today and can’t wait to roast them. Found a recipe for chestnut bisque online that I may try out this weekend! This time last year we were in Italy and I think we ate them at least once everyday! Love the fall/winter! Hmmm. Yet another food I have never had the opportunity to try. One of these days though -who knows – maybe I’ll get around to checking out the chestnuts. I’ve never had chestnuts in my life — but now that you’ve said such great things about them it makes me want to give them a try! Funny about the way your grandmother roasted chestnuts as it is the same method my grandmothers, aunts, mother, wife, etc used. I think one of my grandmothers put water in the pan instead of olive oil. My father roasted them on the top of the stove a few time and usually burned them. *A & L, ooh, chestnut bisque. If you like it, please post the recipe! *Jeni, the first time I saw *a lot* of chestnuts for sale in Central PA was at Wal-Mart, believe it or not! *Sabine, mmm, all these memories of walking down the street with the smell of roasted nuts wafting by…makes me want to go to NYC, London, Rome….! *Zandria, they are such a great cold weather treat; I hope you give them a try. Thanks for stopping by! I’ve been scooped again! I’m working on chestnuts at the moment, too. But not roasted. Boiled and used in a recipe to start. Various types, etc. In retribution I am going to proof your title. Or you can beat me to it. Judith, I’m so looking forward to your recipe! I *do* happen to have some chestnuts here put aside just in case I’m inspired this weekend or soon thereafter. And thanks for the heads up on the title; I was apparently overly concerned with spelling “chestnuts” correctly that I overlooked a more basic every day (hah!) word. For some reason the more I type “chestnuts” the weirder it looks to me…. I love castange ! My mother cooks them up in an old holey pan in the fire. All the new recipes are lagging for lack of appetite. I apparently left it in Florence. Why oh why did this not happen when I wanted to lose weight? yum! how simple and good. i love roasted chestnuts! *Vee, ah another street vendor memory…and yes, the holey pan in the fire is definitely common around here too. *Judith, I think I took it. I’ve been insanely hungry for the past couple weeks. I’ll eat what I consider to be a normal meal and then two hours later I’m starving. My mom says it’s because my metabolism is changing, but I find it rather annoying. I was just looking at a recipe with chestnuts – I’ve never had one. Lisa, ooh, let me know what happens! I have to agree with roam2roam – I could eat a sack of them just like that! The fire is a great idea…thanks! Oh, that’s my most favorite part of the holidays. I can’t wait until next Thursday when I’ll be eating more than my fair share of them. I love the smell of roasting chestnuts. It brings me back to cold winter days walking along in New York. *Minnie, just be sure not to burn your hands! How funny! I just posted about chestnuts, too. I had them for the first time a couple of days ago, and wowee-zowee, they are good! I too just tried roasted chestnuts for the first time at Thanksgiving. I am totally addicted to them now. If you haven’t tried them you should set aside some time this Christmas and fire up a batch. And you don’t need snow and a roaring fire to enjoy them. *Excellent* advice Robert! And it’s never too late in life to try them either! YUM! 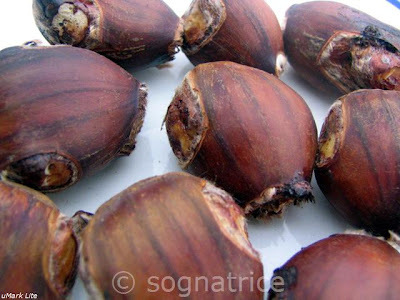 Roasted chestnuts, i call them castagne (italian), are one of my all time favourite foods! Im half Italian and father and Nonna gave them to me all the time in winter when i was a kid. I still love them to this day. At Nonna’s and my Zia’s house, they cook them in a pan on the oven top. At home though, dad cooks them on the bbq. I personally dont mind which way theyre done, although i really do hate it when you get a batch of bad chestnuts, or they’ve been burnt. They’re apparently one of the lowest calorie nuts, too! My dad always says, if you’re going to eat castagne, have a glass of lemonade (he thinks lemonade is the BEST drink to have roasted chestnuts with), because your mouth dries out a bit after a few of them ^^ . OR maybe our “few” is a tad bit too many .